So, how are virtual hosts configured under MAMP? There is a Pro version of MAMP which allows easy configuration of virtual hosts but, unlike it’s baby brother, it’s not free. The only real alternative is to get your hands dirty and configure virtual hosts manually. This is not as difficult as it may sound and can be accomplished fairly easily. As an example I’m going to configure a virtual host for a site that has a root directory of /Users/steve/Sites/mysite1 containing a simple index file and I’ll name the virtual host local.mysite1. I’m going to detail four similar methods of configuring this virtual host all of which accomplish the same thing. Which method you decide upon is really a matter of personal choice but, whichever you choose you’ll first need to edit your Mac’s hosts file and then decide how you want to configure the default virtual host. Your Mac’s hosts file is hidden and located in the /private/etc directory. The easiest way to edit this file is by using an editor such as nano from the command line in Terminal. Type alt + / to go to the end of the file. We need to add a line for each virtual host we want to configure. The comment line beginning # is optional. Type control + o then ↵ to save the file, then control + x to exit nano. In a vanilla installation of MAMP without any virtual host configurations, Apache serves http requests for localhost from the directory defined in Preferences… > Web Server > Document Root. By default this is /Applications/MAMP/htdocs. Once a virtual host has been configured this behaviour changes. Now when Apache receives an http request in the form of a url it attempts to locate the matching virtual host configuration. If it’s unable to locate this configuration it uses the first virtual host configuration it finds. To restore the original default behaviour we need to ensure the first virtual host configuration is configured as the default. If you want files served from another location simply change the DocumentRoot and Directory directives. This doesn’t have to be within the /Applications/MAMP directory. Remember to place a valid index file – as defined by the DirectoryIndex directive – in this directory otherwise Apache will display the directory’s contents. This is also true when using /Applications/MAMP/htdocs as by default it doesn’t contain a valid index file. So far we’ve added the name of a virtual host – local.mysite1 – to the /private/etc/hosts file and looked at how we might want to handle http requests for localhost. Next we’re going to configure the default virtual host and the virtual host for local.mysite1 using one of the following methods. METHOD 1 – Add virtual host configurations to the existing Applications/MAMP/conf/apache/httpd.conf configuration file. METHOD 2 – Add virtual host configurations to the existing Applications/MAMP/conf/apache/extra/httpd-vhosts.conf configuration file. METHOD 3 – Add virtual host configurations to a new configuration file outside of the Applications/MAMP directory. METHOD 4 – Create a new directory outside of the Applications/MAMP directory and populate it with individual virtual host configuration files. To edit or create these files we can use any text editor such as Atom, BBEdit or TextEdit. Open the file /Applications/MAMP/conf/apache/httpd.conf and navigate to the end. # Uncomment the next line if Apache should not accept SSLv3 connections, to learn more google for "POODLE SSLv3". Next, add the configuration for the default virtual host. I’ve decided to use MAMP’s WebStart page. Finally, add the virtual host configuration for local.mysite1. Unlike method 1 – where virtual hosts are configured in /Applications/MAMP/conf/apache/httpd.conf – in method 2 an Include statement points to another file that will hold the virtual host configurations. Open the file /Applications/MAMP/conf/apache/extra/httpd-vhosts.conf and delete all of the current content. Next, add the configuration for the default virtual host. As with method 1, I’ve decided to use MAMP’s WebStart page. This method is virtually identical to method 2. However, unlike method 2 – where virtual hosts are configured in /Applications/MAMP/conf/apache/extra/httpd-vhosts.conf – in method 3 virtual hosts are going to be configured in a new configuration file outside of the /Applications/MAMP directory. I’ve chosen /Users/steve/Dropbox/httpd-vhosts.conf. Open a new empty file. Add the configuration for the default virtual host. 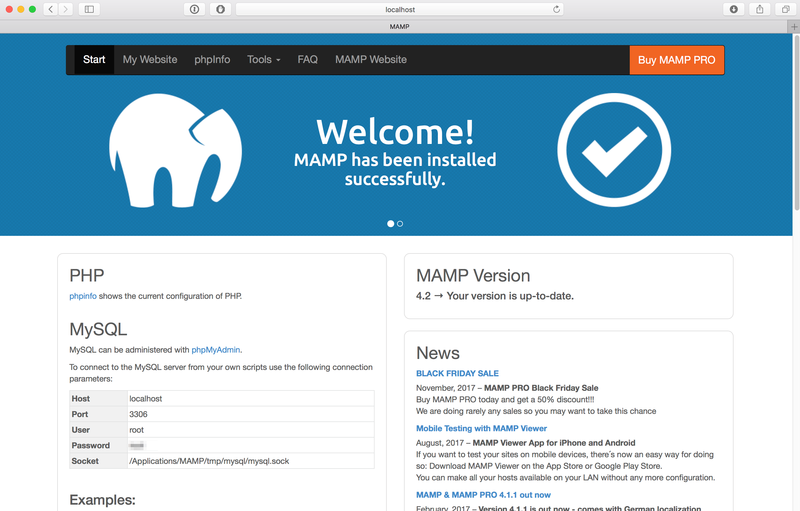 As in the previous methods I’ve decided to use MAMP’s WebStart page. Save and close the file using the same directory path and file name as specified in the Include statement. In my example: /Users/steve/Dropbox/httpd-vhosts.conf. As the heading suggests we’re first going to create a new directory outside of the /Applications/MAMP directory. I’ve chosen /Users/steve/Dropbox/vhosts. Each virtual host configuration will have its own individual configuration file placed in this new directory. We’re going to start in the same way as in the previous 3 methods. Unlike in methods 2 and 3 where we’re including a single file, here we’re including all of the .conf files that’ll be placed in the /Users/steve/Dropbox/vhosts directory. Open a new blank file. Save this file as 000-default.conf in the same directory as specified in the Include statement. In my example: /Users/steve/Dropbox/vhosts. Next, open another new blank file. Save this file as local.mysite.conf in the same directory as specified in the Include statement. In my example: /Users/steve/Dropbox/vhosts. 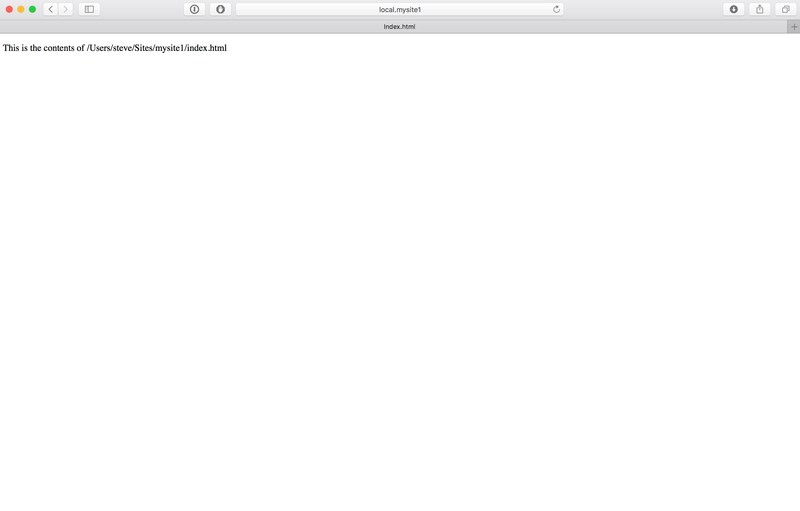 Finally, open the newly-configured sites in a browser using http://localhost and http://local.mysite1. You’d do better contacting the developers. Works great w/ MAMP 1.9.4 on Mac 10.6.6. Thank you SO much! Also, I just noticed that you’re in Japan… Hope you’re safe, and your family and friends are well. Wising you and your neighbors strength, health and good fortune. Glad you’ve got it working and thank you for your kind words. So many sites just talking about the single-site install. Is this method vary with different versions of OSX? Also, any thoughts on MAMP vs XAMP on a Mac? I’ve used it on 10.5 and 10.6 though it probably has as much to do with the version of MAMP as that of the OS. I switched to XAMPP for Mac a couple of years back as at the time MAMP hadn’t been updated for a long time. I now use either one or the other on the Macs I have and IMHO there’s not much between them. I’ve spent what seems like a frustrated eternity trawling through various posts attempting to work out how to install multiple local testing sites with MAMP. This is by far the best post and the code is spot on – I wasted a lot of time with some dud code I picked up elsewhere before finding yours. Thank you Steve – it’s posts like these from people like you that really help newbies like me. You’re welcome Mark. I’m glad you found it helpful.